Product Storage and Surge Bins for finished products, cooked products or product distribution provide a means of flow control in your process. Bin designs are tailored to provide a cost effective solution for your process requirements. 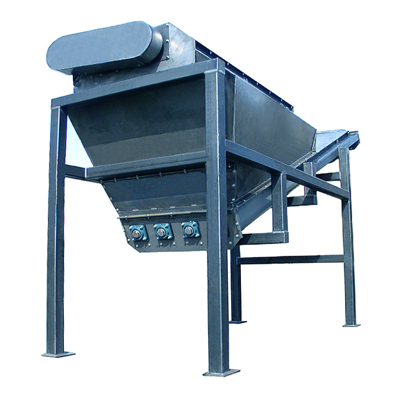 Available in agricultural grade through food and sanitary style construction to meet industry standards. 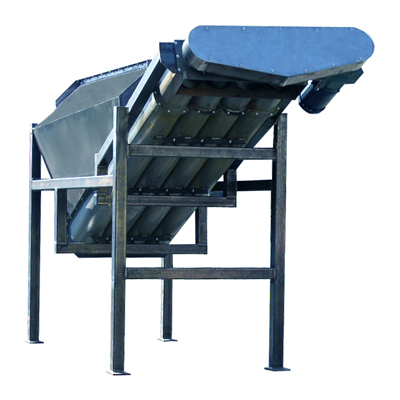 Shown below is an inclined bin that provides surge capacity for a batch process and also gives a metered feed to downstream milling equipment. Bins are also available in standard horizontal configuration with live bottom conveying of either metal slats or conventional belting. Discharge Reels are available for products that do not have free-flowing characteristics and help provide a more metered discharge rate. Please contact us with any questions that you may have.